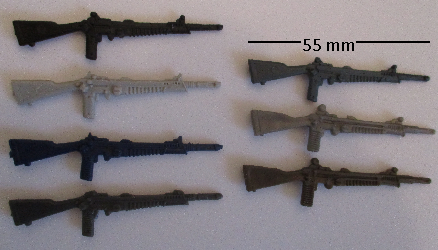 This page contains guns from 37 mm to 56 mm, sorted by approximate length. 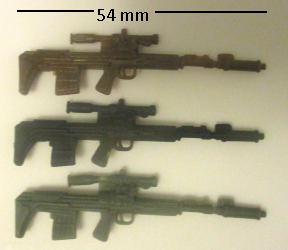 This includes a few of the larger pistols as well as handheld machine guns, many submachine guns, assault rifles, laser rifles and similar futuristic weapons, spearguns, shotguns, carbines, sniper rifles, grenade launchers, and battle rifles in general. 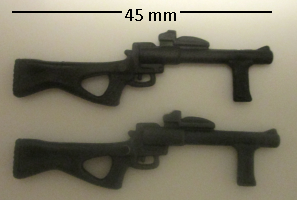 Excluded are bazookas, flamethrowers, and other "gunlike" weapons, as well as machine guns that sit on tripods. 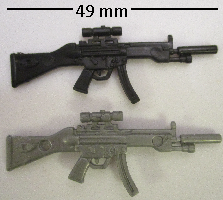 Please note that the toys are often modified from real life or only loosely based on the weapon types listed and linked below. in silver with Knockdown, on the 1987 Battle Force 2000 card as well as his reissue in the 1988 two-pack with Dodger. 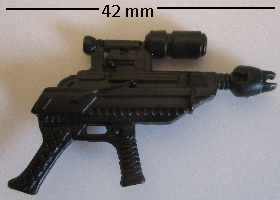 in black with Space Shot, on the 1994 Star Brigade card. in silver with Baroness, in the 2005 Imperial Procession six-pack. 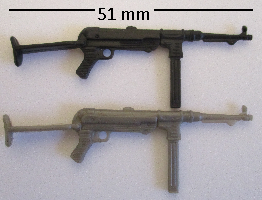 in brown-grey (+Sound Attack tab) with Neo-Viper, the grey version in the 2002 Wave 4 two-pack with Wild Bill. 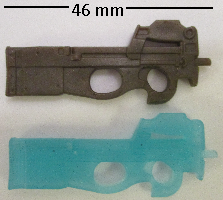 in brown-grey (+Sound Attack tab) with Neo-Viper, the blue O-ring version in the 2003 Wave 7.75 two-pack with Neo-Viper Commander. 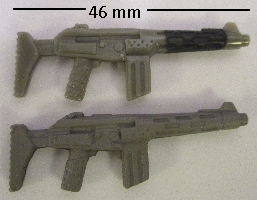 in brown-grey (+Sound Attack tab) with Neo-Viper, the Walmart version in the 2004 two-pack with Gung-Ho. in gold with Cobra Commander, the glider version on the 1991 Wave 2 single card. in gold with Hawk, the brown-jacket version reissued by mail in 1992.
in black with Gung-Ho, the original version on the 1983 single card. 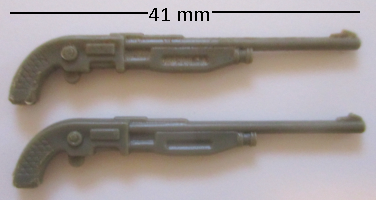 in black with Gung-Ho, the brown version with the Slugger released in 1997.
in light grey with Battle Gear Accessory Pack #2, released in 1984.
in silver with Starduster, the original version offered by mail in 1987 and later years. in black (open-middle) with Toxo-Viper, the original version on the 1988 single card. in black with Crazylegs, the original version on the 1987 single card. 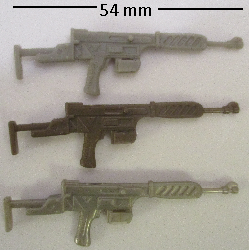 in dark grey with Decimator, with the Hammerhead released in 1990.
in dark gold with Major Storm, the original version with the General released in 1990.
in gold with Major Storm, the jungle camo version in the 2003 Operation: Anaconda convention set. 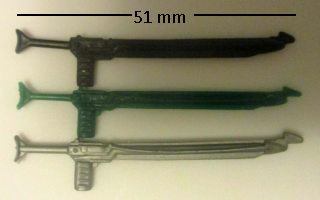 in dark green with Tomax, the 25th-style version in the 2008 Comic #36 1/2 two-pack with Xamot. in dark green with Xamot, the 25th-style version in the 2008 Comic #36 1/2 two-pack with Tomax. 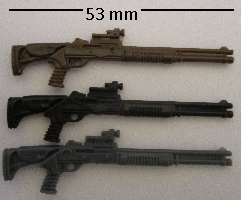 in brown with Cobra Trooper, the white straps version in the 2008 The M.A.S.S. Device DVD pack. in black with Cobra Pilot, with the Cobra F.A.N.G./Cobra C.L.A.W. 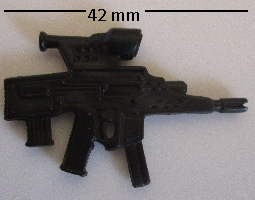 vehicle set released in 2008.
in graphite with Flint, the Cobra disguise version on the 2008 Wave 11 single card. in graphite with Cobra Paratrooper, in the 2008 G.I. Joe: The Movie DVD pack. in black with Tomax, the original version in the 1985 Crimson Guard Commanders two-pack with Xamot, as well as his reissue by mail. in black with Xamot, the original version in the 1985 Crimson Guard Commanders two-pack with Tomax, as well as his reissue by mail. in black with Tomax, in the 2002 Real American Hero Collection two-pack with Xamot. in black with Tomax, in the 2002 Real American Hero Collection two-pack with Tomax. in silver with Lamprey, the original version with the Moray released in 1985, as well as his reissues by mail. 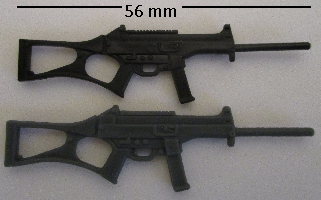 in dark grey with Updraft, with the Retaliator released in 1990.
in grey with Skyduster, the 25th-style version in the 2008 Senior Ranking Officers three-pack. in black with Dusty, the original version on the 1985 single card. in black with Dusty, the original version on the 1988 single card. 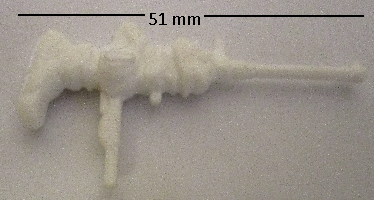 in grey with Dusty, the 25th-style version in the 2008 Arise, Serpentor, Arise! DVD pack. in black with Dr. Mindbender, the red Spy Troops version in the 2003 Wave 6 two-pack with Dart. in silver with Dr. Mindbender, the purple Joe vs. Cobra version in the 2002 Wave 3 two-pack with Beach Head. in black with Iron Grenadier, the original version on the 1988 single card. in black with Iron Grenadier, the glossy 25th-style version in the 2008 Comic #7 two-pack with Destro. in black with Iron Grenadier Officer, the flat black 25th-style version in the 2008 Senior Ranking Officers three-pack. 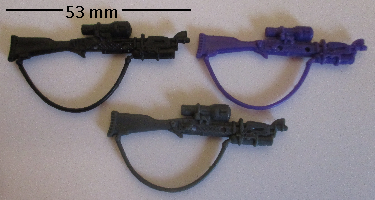 in black with Iron Grenadier Trooper, the purple IG in the 2008 Senior Ranking Officers three-pack. in grey with Snake Eyes, the silver crossed-swords version on the 1989 single card. in silver with Storm Shadow, the white-and-red Joe vs. Cobra version in the 2002 Wave 1 two-pack with Snake Eyes. 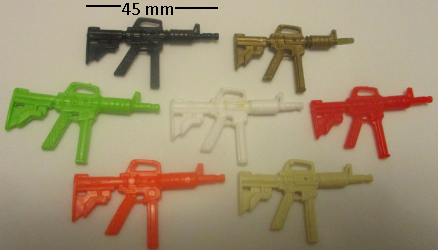 in silver with Storm Shadow, the grey-and-red Joe vs. Cobra version in the 2002 Wave 1.35 two-pack with Snake Eyes. in silver with Snake Eyes, the black O-ring version reissued on the 2004 Wave 1 single card. 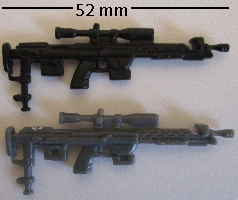 in black with Night Creeper, the grey version in the 2004 Wave 5 two-pack with Ninja Trooper. 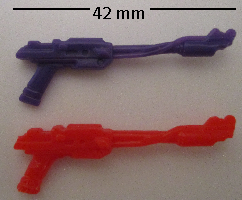 in graphite with Cobra C.L.A.W.S., the purple Joe vs. Cobra version in the 2002 Wave 4 two-pack with Dart. 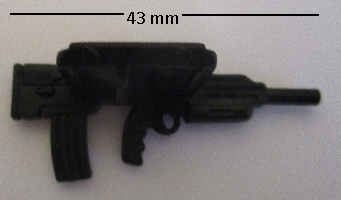 in graphite with Cobra C.L.A.W.S., the Walmart version in the 2004 two-pack with Roadblock. 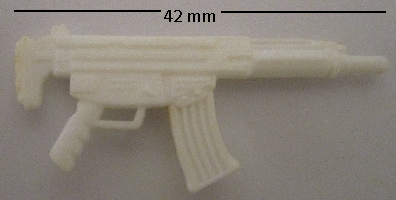 in dark grey with Low-Light, the green version in the 2008 S.W.A.T. convention three-pack. in light grey (2 copies) with Rock & Roll, the Gatling version on the 1989 single card. in red with Spirit, on the 1992 Air Commandos single card. in dark grey with General Mayhem, in the 2005 General Mayhem: M.A.R.S. Invades! convention set. in orange with Tracker, on the 1991 Wave 2 single card. in gold with Dee-Jay, in the 1993 Arctic Commandos mail-order set. 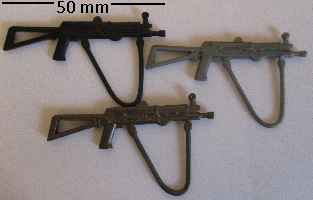 in gold with the Rapid Deployment Force, offered by mail in 1993.
in dark grey with Gung-Ho, in the 2005 Steel Brigade convention three-pack. in black with Cobra Commander, the hooded version in the 2000 Real American Hero Collection two-pack with Chameleon. in black with Air Devil, on the 1992 Air Commandos single card. 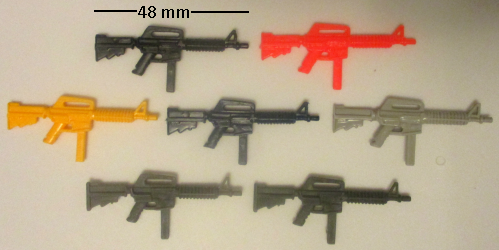 in black (+Sound Attack tab) with Baroness, the Joe vs. Cobra version in the 2002 Wave 3 two-pack with Flint. in black (+Sound Attack tab, 2 copies) with Cobra Squad Leader, the black mask version in the 2005 Cobra Night Watch six-pack. in black with Outback, the original version on the 1987 single card. 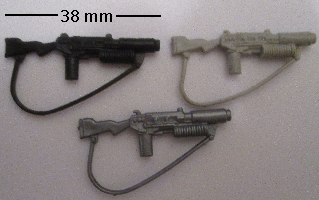 in black with Outback, the 25th-style version with the FLAK Cannon/Cobra CLAW vehicle set released in 2009.
in dark grey with Grand Slam, in the 2007 Jet Pack Troopers convention 2-pack with Starduster. in dark grey with Starduster, in the 2007 Jet Pack Troopers convention 2-pack with Grand Slam. in black with Destro, the disc launcher version on the 1992 Wave 1 single card. in black with Destro, the dark red version in the 1997 Cobra Command Team three-pack. in black with Destro, in the 2001 Real American Hero Collection two-pack with Fast Blast Viper. in black with Zartan, the red Joe vs. Cobra version in the 2002 Wave 2 two-pack with Agent Scarlett, as well as his reissue with 2003 Mission Disc #3.
in black with Zartan, the green Joe vs. Cobra version in the 2002 Wave 3 two-pack with Sgt. Stalker. in black with Neo-Viper, the blue O-ring version reissued on the 2004 Wave 1 single card. in dark grey with Undertow, the red version in the 2002 Sound Attack eight-pack. in clear with Zartan, the clear 2003 G.I. Joe Collector's Club annual exclusive figure. 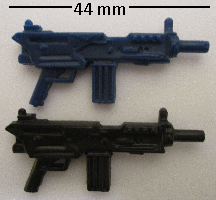 in blue with Barricade, the blue version on the 1992 Wave 2 single card. in blue with Barricade, the orange version on the 1993 Battle Corps card. 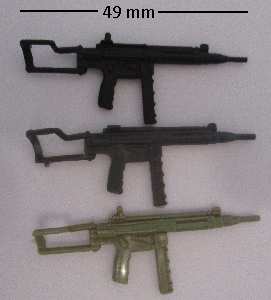 in black with Cutter, the green version with the Shark 9000 released in 1993.
in black with Barricade, in the 2004 Anti-Venom Strike Force six-pack. in brown with Sergeant Hacker, in the 2003 Wave 5 two-pack with Scalpel. 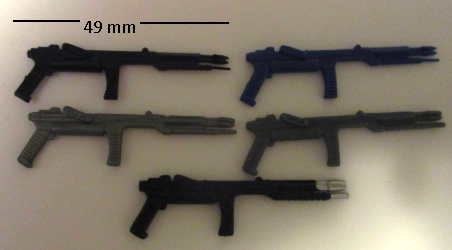 in black with Cobra Commander, the blue helmet version in the 2003 Wave 8 two-pack with Switch Gears. in black with Outback, on the 2008 Direct-to-Consumer Wave 4 single card. in bronze with Coil Crusher, the brown-pads version in the 2004 Wave 3 two-pack with Wild Bill. 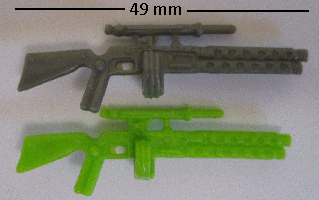 in grey with Shipwreck, the green Valor vs. Venom version in the 2005 Wave 6 two-pack with Electric E.E.L. 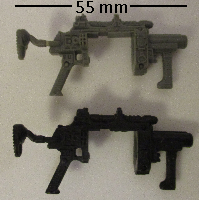 in dark grey with Red Dog, in the 2006 Slaughter's Marauders convention three-pack. in black with Hit & Run, on the 1988 single card as well as his Target-exclusive reissue the same year. in black with Snow Serpent, the blue version in the 1993 Arctic Commandos mail-order set. 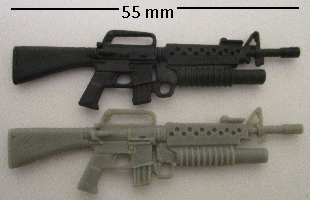 in graphite with Cobra B.A.T., the 3.0 Joe vs. Cobra version in the 2002 Wave 4 two-pack with Shipwreck. in black with Infantry Division, the white goatee version in the 2005 Heavy Assault Squad six-pack. 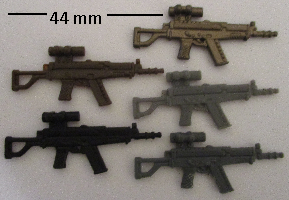 in brown with Recondo, the black version with the Tiger Storm released in 2004.
in silver (2 copies) with Pit Viper, the grey version in the 2003 Wave 8 two-pack with Night Force Duke, as well as his reissue in the 2004 Battle in a Box set. in black with Destro, the muscle shirt version in the 2003 Wave 7 two-pack with Grunt. 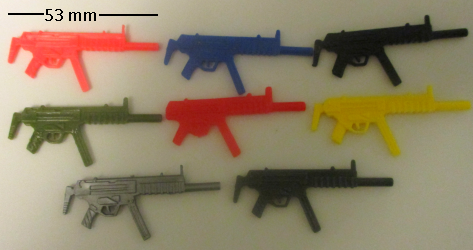 in black with Agent Faces, the Crimson Guard version offered by mail in 2003.
in black with Destro, the jacketed version in the 2004 Wave 2 two-pack with Kamakura. 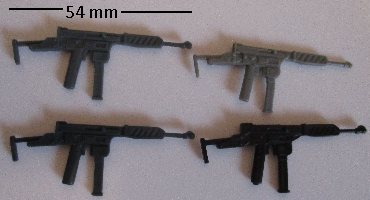 in black with Crimson Guard, one each with all three versions in the 2003 Operation Crimson Sabotage set. 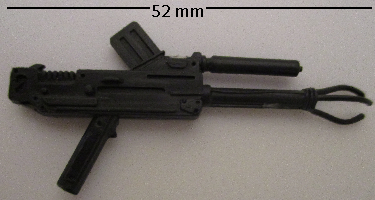 in black with Duke, in the 2005 Heavy Assault Squad six-pack. in black with Monkey Wrench, on the 2006 Direct-to-Consumer Wave 3 single card. in green with Flint, the no-gloves 25th-style version on the 2007 Wave 1 single card. in green with Flint, the dirty-boots 25th-style version on the 2009 Hall of Heroes single card. in black and brown with Gristle, in the 2008 Cobra Headhunters convention set. 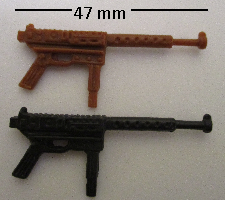 in black with Blowtorch, the brown Joe vs. Cobra version in the 2002 Wave 3 two-pack with Snow Serpent. in neon green with Rapid-Fire, with the Revenge of the Pharaohs VHS tape released in 1991.
in silver with Taurus, the original version in the 1987 Sgt. Slaughter's Renegades three-pack. 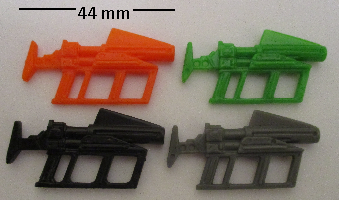 in brown-grey (+Sound Attack tab) with Dart, the green-vest version in the 2002 Wave 4 two-pack with Cobra C.L.A.W.S., as well as his reissue in the 2004 Battle in a Box set. 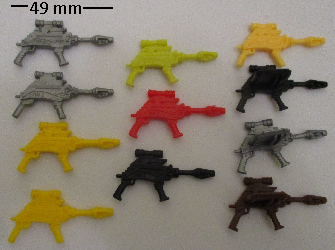 in black (+Sound Attack tab) with Dart, the brown-vest version in the 2003 Wave 6 two-pack with Dr. Mindbender. 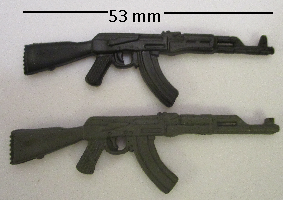 in grey with Tele-Viper, the grey 25th-style version in the 2008 Arctic Assault Squad seven-pack. 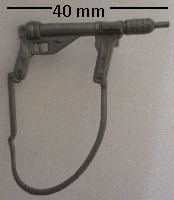 in light grey with Mercer, the original version in the 1987 Sgt. Slaughter's Renegades three-pack. 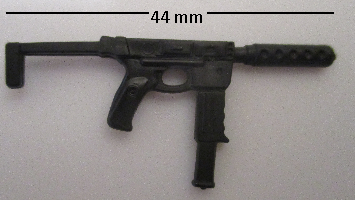 in black with Crossfire, in the 2001 Real American Hero Collection two-pack with Double Blast. in blue with Sky Creeper, on the 1991 Air Commandos single card. in black with Flash, the original version on the 1982 single card, as well as his 1983 swivel-arm release on card and later by mail, and in J.C. Penney three-packs. in black (with very stiff cord) with Breaker, in the 1997 Stars & Stripes Forever set. 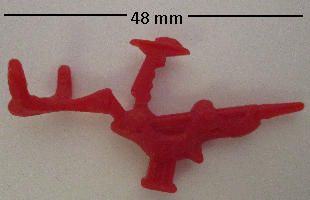 in red with Golobulus, in the 1987 Cobra-La three-pack. in black with Sergeant Stalker, in the 2004 Desert Patrol Squad six-pack. in black with Tommy Arashikage, the Vietnam-era Storm Shadow in the 2006 Marvel #26 comic three-pack. in black with Stalker, the original version on the 1982 single card, as well as his 1983 swivel-arm release on card and later by mail, and in J.C. Penney three-packs. in black with Stalker, in the 1997 Stars & Stripes Forever set. in light green with Duke, the original version offered by mail in 1983 as well as his reissue on 1984 single card. 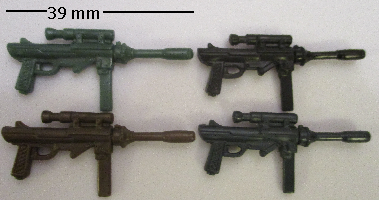 in light green with Firefly, the brown version in the 2000 Real American Hero Collection two-pack with Undertow. 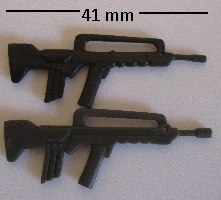 in black (+Sound Attack tab) with Firefly, the Joe vs. Cobra version in the 2002 Wave 2 two-pack with Nunchuk. in black (+Sound Attack tab) with Dial Tone, the green-and-black version reissued with the A.W.E. 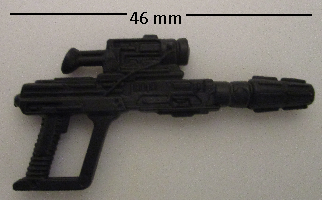 Striker released in 2003.
in silver (+Sound Attack tab) with Firefly, the red version in the 2002 Sound Attack eight-pack. 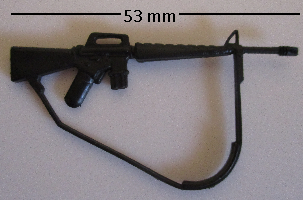 in silver (+Sound Attack tab) with Sergeant Hacker, in the 2003 Wave 5 two-pack with Scalpel. in black with Cobra Commander, the blue O-ring version in the 2002 Joe vs. Cobra Wave 3 two-pack with Snake Eyes, as well as his reissue with the 2003 Mission Disc #3.
in silver with Dr. Link Talbot, the red version in the 2004 Wave 4 two-pack with Night Creeper. in black and silver with Cobra Eel, the 25th-style version on the 2008 Wave 11 single card. in green with General Hawk, the neon version offered by mail in 1993.
in silver with Sci-Fi, the white version with the Starfighter released in 1993.
in silver with Sergeant Flash, in the 2007 Tanks for the Memories convention set. 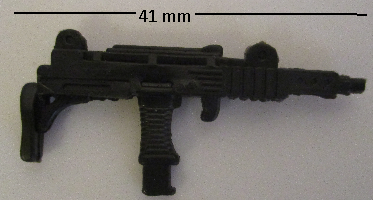 li>in silver (with filled-in trigger guard) with Destro, on the 1993 Star Brigade Armor-Tech card. 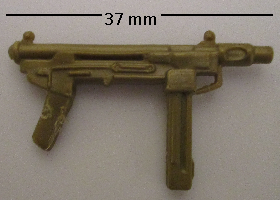 in yellow (with filled-in trigger guard) with Cobra B.A.A.T., on the 1993 Star Brigade Armor-Tech card. 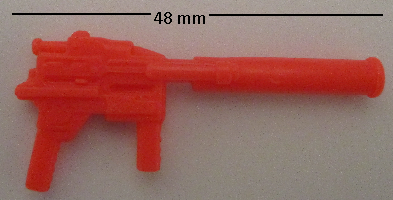 in silver (+Sound Attack tab) with Fast Blast Viper, the red version in the 2002 Sound Attack eight-pack. 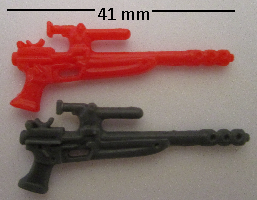 in brown (+Sound Attack tab) with Shock Viper, the red version in the 2002 Wave 4 two-pack with Dusty. 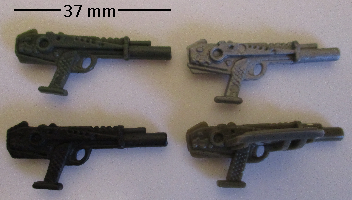 in silver with Scrap-Iron, the grey 25th-style version in the 2008 Arctic Assault Squad seven-pack. in black and brown with Flint, the snarling 25th-style version in the 2009 G.I. Joe five-pack. in black and brown with Flint, the dirty-boots 25th-style version on the 2009 Hall of Heroes single card. in black with Grunt, the original version on the 1982 single card, as well as his 1983 swivel-arm release on card and later by mail, and in J.C. Penney three-packs. in dark blue with the Rifle Range Unit, released in 1985 and reissued by mail in later years. in black with Deep-Six, the purple version on the 1992 Eco-Warriors card. 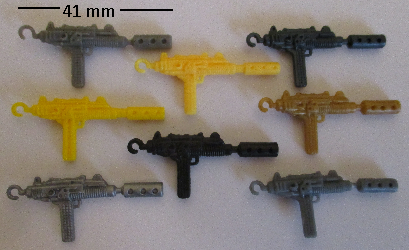 in gold with Deep Six, the yellow version offered by mail in 1993.
in black with Reservist, offered by mail in 2002.
in black with Nunchuk, the Joe vs. Cobra version in the 2002 Wave 2 two-pack with Firefly, as well as his reissue in the 2004 Battle in a Box set. in black with Snake Eyes, the gold crossed-swords version in the 2002 Sound Attack eight-pack. 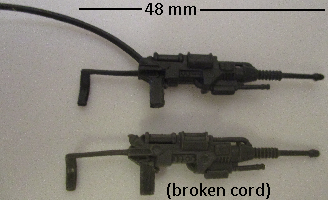 in black with Nunchuk, the Night Force version in the 2003 Wave 7.75 two-pack with Cross Hair. 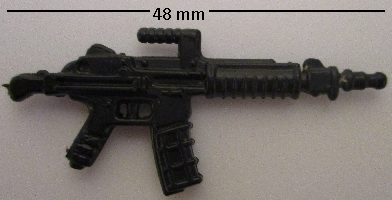 in black with Alpine, the Tiger Force version in the 2004 Wave 5 two-pack with Cross Hair. 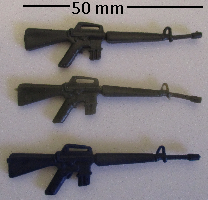 in black with Infantry Division, the blond version in the 2005 Heavy Assault Squad six-pack. in black with Ice-Viper, the blue-mask version in the 2007 Flaming M.O.T.H. two-pack with Snow Serpent Commander. in graphite with Duke, the O-ring Joe vs. Cobra version in the 2002 Wave 4 two-pack with Dreadnok Ripper, as well as his reissue with the 2003 Mission Disc #1.
in black with Duke, the Night Force version in the 2003 Wave 8 two-pack with Pit Viper. in silver with the V.A.M.P. 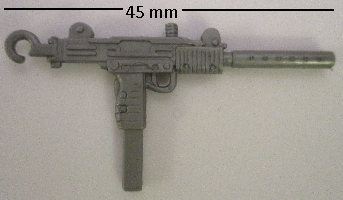 with Twin Battle Gun, released in 2004.
in black with Torpedo, the original version on the 1983 single card as well as in J.C. Penney three-packs. in black with Torpedo, the all-black version with the Night Landing released in 1997.
in silver with Wet Down, in the 2001 Real American Hero Collection two-pack with Wet-Suit. in silver with Wet-Suit, the black Joe vs. Cobra version in the 2002 Wave 1 two-pack with Cobra Moray. in silver with Wet-Suit, the teal Joe vs. Cobra version in the 2002 Wave 1.35 two-pack with Cobra Moray. in black with Sergeant Mutt, on the 2005 Direct-to-Consumer Wave 1 single card. 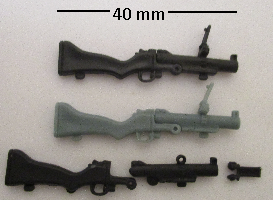 in dark silver with Sergeant Stalker, the dark green 25th-style version in the 2008 Ultimate Battle Pack. 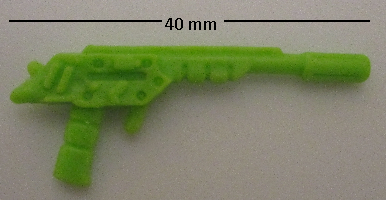 in black with Interrogator, the original version with the Cobra Battle Copter released in 1991.
in neon yellow with Eel, the blue version on the 1992 Wave 2 single card. in black with Dusty, in the 2004 Desert Patrol Squad six-pack. in dark grey with Major Bludd, in the 2006 Cobra's Most Wanted: Mercenaries! convention set. in grey with Snow Serpent, the blue-buckle 25th-style version on the 2008 Wave 9 single card. 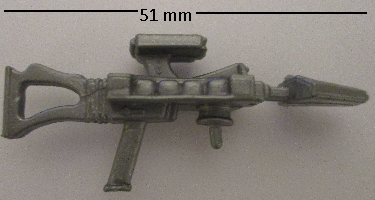 in grey with Snow Serpent Trooper, the silver-buckle heavy weapons version in the 2008 Arctic Assault Squad seven-pack. in grey with Snow Serpent Officer, in the 2008 Arctic Assault Squad seven-pack. in black with Cobra Officer, the original version on the 1982 single card and with the 1982 Missile Command Headquarters, as well as his 1983 swivel-arm release and its reissues by mail. in black or white with Python Trooper, on the 1989 single card. in black with Footloose, the original version on the 1985 single card. in purple with Heli-Viper, with the Cobra Battle Copter released in 1992.
in dark grey with Night-Viper, in the 2006 Flaming M.O.T.H. 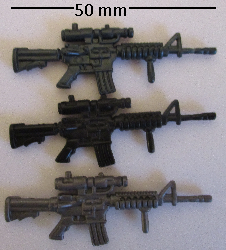 two-pack with Frag-Viper. in pink with Cloudburst, on the 1991 Air Commandos single card. 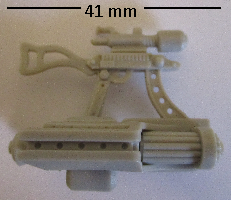 in red (with filled-in trigger guard) with Duke, on the 1993 Star Brigade Armor-Tech card. 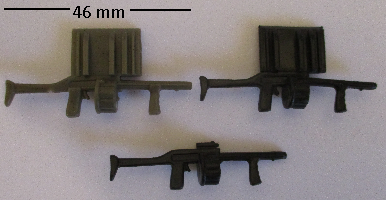 in grey with Major Altitude, the blue version offered by mail in 1993.
in black (with two holes) with Grunt, the missile launcher version on the 1991 Wave 2 single card. in light green with Effects, on the 1994 Star Brigade card. in black with Lieutenant Falcon, the 25th-style version in the 2008 Comic #8 two-pack with Nemesis Immortal. 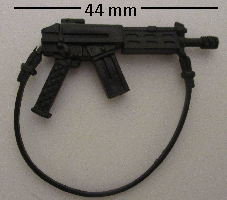 in black with Snow Serpent Trooper, the silver-buckle combat version in the 2008 Arctic Assault Squad seven-pack. in black with Scarred Cobra Officer, in the 2008 Comic #32 1/2 two-pack with Crimson Guard. 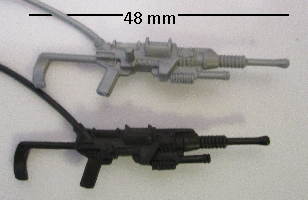 in dark grey with Cobra Stinger Driver, with the Cobra Stinger released in 2009.
in grey with Snow Serpent, the original version on the 1985 single card. in grey with Beach Head, the original version on the 1986 single card. 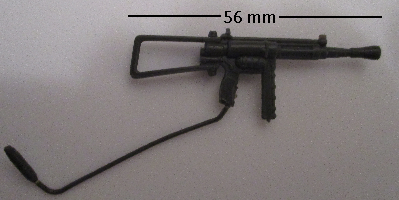 in dark grey with Firefly, the red version in the 2002 Sound Attack eight-pack. 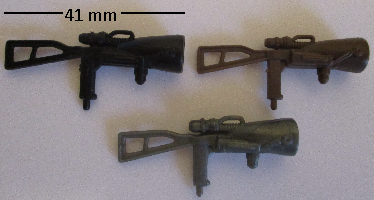 in brown with Recondo, the Spy Troops version in the 2003 Wave 5 two-pack with Iron Grenadier. in grey with Range Viper, the removable helmet version on the 2005 Direct-to-Consumer Wave 2 single card. in silver with Beachhead, the dark green 25th-style version on the 2009 Hall of Heroes single card. in black with Airborne, the original version on the 1983 single card as well as reissues by mail. in grey with Steel Brigade, the silver-head version offered by mail in 1987 and later years. in black with Flash, the astronaut version in the 2005 Marvel #8 comic three-pack. in black with Snake Eyes, in the 2005 Heavy Assault Squad six-pack. in black with Snake Eyes, the purple 25th-style visor version in the 2008 The Pyramid of Darkness DVD pack. 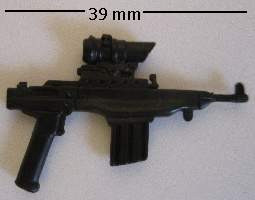 in black with Lady Jaye, the light-haired 25th-style version in the 2009 G.I. Joe five-pack. in brown with Snake Eyes, the radioactive version in the 2008 The M.A.S.S. Device DVD pack. in brown with Sergeant Stalker, the yellow-green 25th-style version in the 2008 The M.A.S.S. Device DVD pack. in brown with Dusty, the 25th-style version in the 2008 Arise, Serpentor, Arise! DVD pack. in black with Muskrat, the original version on the 1988 single card as well as his reissue in the Ultimate Enemies two-pack with Voltar. 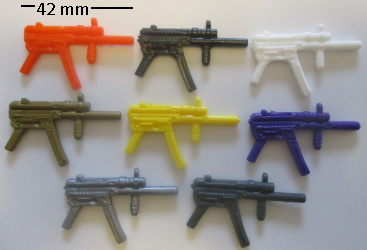 in gold (+Sound Attack tab) with Dr. Mindbender, the purple Joe vs. Cobra version in the 2002 Wave 3 two-pack with Beach Head. 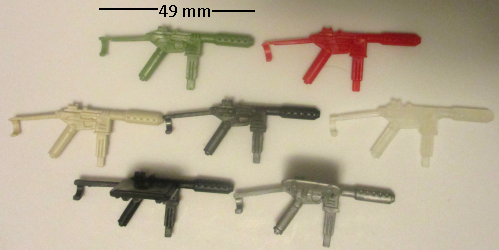 in silver (+Sound Attack tab) with Recondo, the Spy Troops version in the 2003 Wave 5 two-pack with Iron Grenadier. 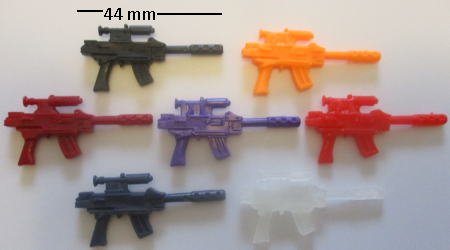 in black (+Sound Attack tab) with Dr. Mindbender, the red Spy Troops version in the 2003 Wave 6 two-pack with Dart. in grey with Hardball, on the 1988 single card. in dark grey with the MANTA, offered by mail in 1983 and later years. in black with Crimson Guard, on the 2005 Direct-to-Consumer Wave 1 single card. in black with Baroness, the blue 25th-style version on the 2008 Wave 8 single card. in black with Baroness, the silver-lined version in the 2009 Cobra five-pack.